Soil Reinforcement for Anchor Plates and Uplift Response presents a comprehensive and rigorous review of the current knowledge in soil improvement for anchor plates, and is based on original research that includes experimental data on how to enhance uplift response of soil anchor plates by using several soil reinforcement methods. Divided into 6 chapters, the author makes an introduction to both Ancho Plates and Soil Reinforcement in chapter one, then providing a comprehensive literature review on the topic in chapter 2. Chapter 3 presents how the experiment was set up, the different types of geotextiles used, and the types of soil tested. Chapter 4 presents experimental data, along with data provided by simulation softwares, including Plaxis. Chapter 5 compares the experimental results to the numerical simulation data, providing researchers and geotechnical engineers with tools they can apply to their own projects. 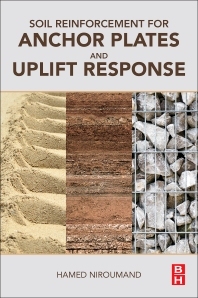 In chapter 6, the author presents his conclusions and recommendations on the usage of soil reinforcement to maximize uplift response to anchor plates. Researchers in geotechnical engineering can use the methods and experimental data presented in the book on their own projects, and practicing engineers will benefit from the comparisons between experimental and simulation data provided to make appropriate selection of soil reinforcement techniques that can be applied to their projects. Dr Hamed Niroumand is an assistant professor at Department of Civil Engineering, Buein Zahra Technical University. He is currently the Vice-Chancellor for the Research and Academic, Buein Zahra Technical University. His main fields of research are geotechnical engineering, earth anchors, deep foundation, numerical analysis, sustainable development, and nano-materials. He is a project manager and professional engineer in various geotechnical and earth buildings projects. In the year 2011, 2012, 2013 and 2015, he got various awards such as four medals and international awards for his inventions and researches and the 1st rank of research section at the national Iranian young inventor and researcher festival 2012 and the 1st rank of research section at the national Iranian youth festival 2012 and 2013. He got the best researcher award in Ministry of Road and Urban Development (MRUD) in 2016. He was the chairman and head director of the international/national conferences of civil engineering near to 20 cases that held in various countries. He chaired sessions in several international/national conferences and festivals in various countries. He presented various research papers in many conferences around the world. He published around 200 papers in journals and conferences. He is editorial team and reviewer in scientific journals. He has invented around 15 inventions that are patent/patent pending at this moment. He received many awards for his researches.